We will be riding Qhubeka Buffalo bicycles as part of the #Joburg2Kili expedition. Many people have asked us what makes these bicycles different from normal road and mountain bikes so we thought we would put together this post to introduce you to these bicycles. 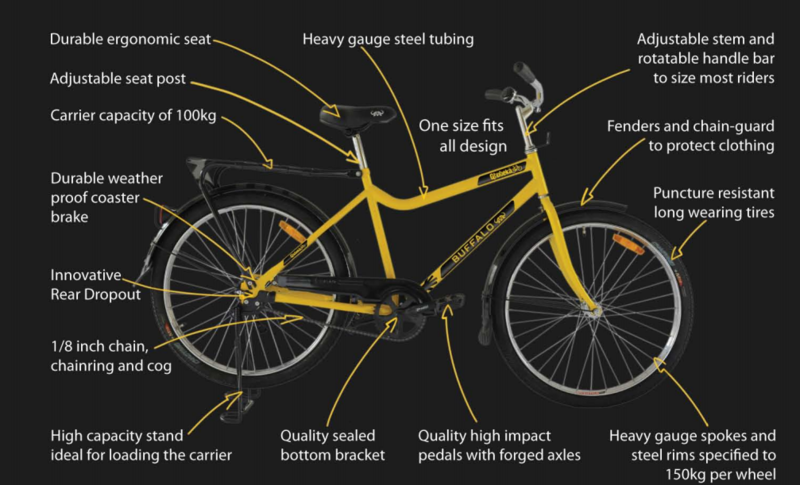 So what is Qhubeka Buffalo Bicycle? The Qhubeka Buffalo bicycle is a robust, single-speed bicycle engineered specifically for African terrain and load requirements.It is designed by World Bicycle Relief in Chicago USA, tested and assembled in South Africa. The bicycles are built to be as tough as the fierce African buffalo, a symbol of strength and power; hence the brand name Buffalo Bicycle. One size fits all – This has proven a bit problematic for Warrick who is 6’4” tall so we have had to get a new saddle post for him and also lengthened the handlebar stem. Single-speed – Yes it has NO gears which is going to make climbing hills more challenging but we should come back with very strong, muscular legs after this trip. Rear carrier which can carry up to 100kg – We have removed this from Camilla’s bicycle and put on a lighter pannier onto Warrick’s bicycle which will carry a daypack including water, nutrition and medical supplies for each ride. Bicycle weighs about 23kg – To put this in perspective an average road bike weighs between 6-10kg and an average mountain bike weighs between 8-13kg. We have reduced the weight of the bicycles slightly by removing the steel pannier carrier and chain-guard and exchanging the steel mud-guards with plastic mud-guards. Back-pedal braking system – This braking system has taken time to get used to especially as we have put our cleat pedals onto the bicycles which makes stopping more challenging as you have to remember to uncleat and back-pedal at the same time. We have also now included a front caliper brake onto each bike just as an extra precaution. Kickstand – This is our favourite feature of the bicycle. The kickstand means we do not have to worry about leaning our bikes up against something when we take a break from riding. We can literally just rack them up on the kickstand wherever we are. Ergonomic saddle – As saddle comfort is going to be vital to this expedition we have replaced the standard saddles with a Sportourer saddle each. Bell – We have both enjoyed giving the bell a ring as we pass fellow riders and commuters on some training rides. Helmet – It is really fantastic that a helmet is included with each bicycle as it is essential to wear a helmet whilst riding for safety. As we have been cyclists for many years and already have helmets, we have decided to donate our Qhubeka helmets to two people who do not have helmets whilst riding. In summary, the Qhubeka bicycles are built for Africa so we are looking forward to proving their durability on this expedition. Next Article Next Article: Over R50,000 raised so far – Thank you!